International trade ministers and corporate lobbyists will be descending on Texas from May 8 to 16 for a critical trade summit aimed at rushing the secretive new Trans-Pacific Partnership (TPP) Free Trade Agreement towards completion. 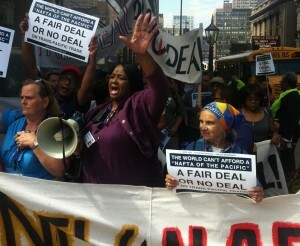 The Texas Fair Trade Coalition and our allies are planning to welcome them — and we need you to join us. TPP: Out of the Shadows! The May 12th rally and march is the main event while negotiators are in town. It features a permitted rally with trade justice advocates from around the world, followed by a march down to the negotiation site. It has been endorsed by the Citizens Trade Campaign, Code Pink, Communications Workers of America, Dallas AFL-CIO Council, Dallas Peace Center, Friends of the Earth, International Association of Machinists, International Brotherhood of Electrical Workers, International Brotherhood of Teamsters, MoveOn.org Dallas, National Family Farm Coalition, North Texas Jobs with Justice, Occupy Austin, Occupy Dallas, Occupy Texas, Public Citizen, Sierra Club, Texas AFL-CIO, Texas State Building Trades Council, United Steelworkers, United Students Against Sweatshops, Welcoming Immigrants Network and many others. Join trade justice advocates from around the world for an activist reception starting at 6:00pm, followed by a teach-in at 7:00pm with national and international speakers including Lori Wallach (Global Trade Watch), Celeste Drake (AFL-CIO), Ilana Solomon (Sierra Club), Sanya Reid Smith (Third World Network) and Kelli Seals-Obazee (Dallas Peace Center). The Texas AFL-CIO, the Texas Fair Trade Coalition and others held a press conference demanding transparency in the TPP negotiations and delivering a petition signed by more than 24,000 Americans urging that negotiators release the texts. The TPP negotiations are a big deal, and people will be coming from far-and-wide to ensure that the 99%’s voices are heard by negotiators. If you can put up one or more activists, or if you’re still looking for housing, please use the following forms. No guarantees., but folks will try to match you. Other events are being organized for throughout the negotiations. Instead of being debated out in the open, the TPP has thus far been negotiated in the shadows. Approximately 600 corporate lobbyists have been given special “cleared advisor” status to review negotiating documents and advise negotiators. Meanwhile, the general public has been barred from even reviewing what U.S. negotiators have proposed in our names. The twelfth major round of TPP negotiations — perhaps one of the last — is taking place at the Intercontinental Dallas Hotel in Addison, Texas, from May 8 to 18. Please join us in dragging these negotiations into the light of day and ensuring that we aren’t saddled with a back-room deal that enriches the global 1% at the expense of the economy, the environment, family farms, public health and democracy itself. TAKE ACTION: Please help put an end to this type of back room dealmaking by signing our online petition demanding that negotiators release the texts. The petition will be delivered to negotiators during a press event outside Dallas on May 8th.